Thanks for the article. We have a similar need (i.e) where we need CAS to query against Drupal database. Can you explain on how you achieved this. We have MD5 hashed passwords. At a bare minimum, I believe you can just customise the deployerConfigContext.xml file. Here’s an example of the deployerConfigContext.xml file we use, is that what you were after? In that example the datasource is referred to via JNDI. There is also an older example where the datasource is defined inline within the spring configuration. I was thinking of implementing the same but with drupal 7. Any idea about what passwordEncoder will be used? I am asking this because D7 uses sha-512 for password encryption (drupal 6 used md5) and might also be using iterations to further strengthen the password. With this in mind, could you please suggest the appropriate passwordEncoder property? Hi Ayan, I’m sorry I don’t have the answer off-hand, try asking on the CAS users list. as far as I can tell there is no existing password encoder in java that does the same hashing as D7. D7 uses SHA512, but also uses a configurable number of iterations, a salt, a custom prefix to store which encoding was used and last not least only stores a configurable substring of the complete 512 characters hash. I ended up modifying password_inc to use standard MD5 again (if you are concerned you can also use regular SHA256 or 512). That way I could use the out of the box password encoder. Mimicking the D7 encoder with all its configuration options in java seemed not a good idea. Good end of the story is that it worked! 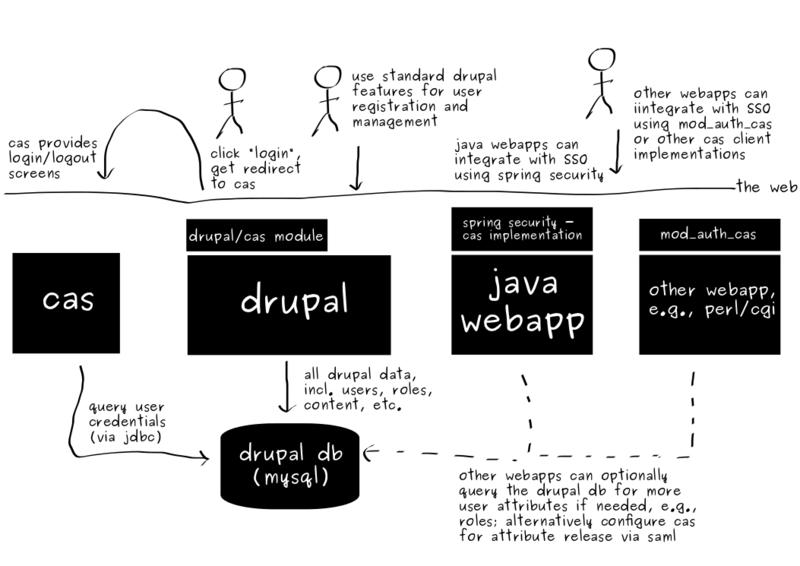 We did consider a similar approach as well but our drupal site already had quite a few existing users. Changing password hash mechanism would have required resetting passwords for the existing users which was not an option for us. So we ended up authenticating CAS against the magento db (was part of bigger picture that required SSO). Magento’s password hashing technique was relatively simpler to replicate in a custom password encoder (i.e salt+md5(pass):salt). Thanks for taking the time to create this article: very very very helpful! In your diagram, you left out phpCAS as a client, which is the most feature rich (https://wiki.jasig.org/display/CASC/Client+Feature+Matrix). Incidentally, what tool did you use to diagram? No, because CAS is configured to use the Drupal database as the database of user credentials. I.e., Drupal and CAS are both pointing at the same database of users. Does that answer your question? The cas module for Drupal creates a second table of cas_users that needs to be populated too though, even if CAS uses directly the Drupal tables. The cas module won’t work if that other table isn’t populated – at least it doesn’t work for me. Don’t you need the cas_user table? Excellent overview. I don’t think touching Java or Apache config will be an option for me, but I will definitely look into the CAS module for Drupal 7.